Do you sign your emails the same way 80% (or even 100% of the time)? Do you find yourself retyping bits of text, like “let’s meet up – send me your information” and “here’s our latest press list”. If you’re like me, you’d really benefit from using a small piece of software to help you be more productive (a little bit at a time) all the time. I’ve been using Smile Software’s TextExpander for several months now, and I’m amazed at the amount of time I save from emails I send a lot of the time. Please suggest a time for us to talk at http://tungle.me/gregmeyer – this is a service I use to schedule meetings with fewer back-and-forth emails – I hope you find it useful. I don’t spend as much time typing stuff over and over and make fewer mistakes. I send similar standard emails based on tasks, which saves a lot of time in my day when I already know what I’m going to write. I can focus on the message I’m adding to the email and less upon the actual nuts-and-bolts of the process. This makes a four- or five-sentence email into a much shorter process. I have a standard reply when I’m solicited by people I don’t know. This one’s my favorite – how many times have you received semi-junk email (“bacn”) and thought, “I’d like to reply, but I don’t have the time.” I now have boilerplate that I’m able to customize quickly and respond to the other email quickly without breaking my flow. I can share my best “snippets” with my teammates. Now that several people on my team at work are also using TextExpander, I can literally make them more productive immediately by writing a TextExpander snippet and saving it in our group Dropbox folder. This is an excellent way to standardize a marketing message, prepare three or four standard replies to an inbound query, or just to make everyone happier that they can type less. My best productivity hack is that I get to think more about what I want to say. 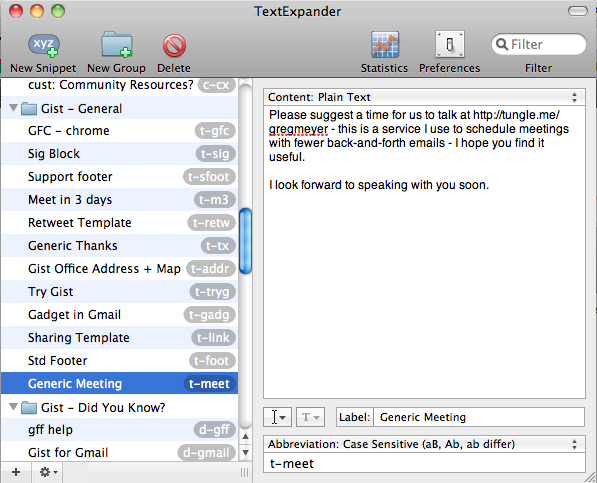 Thanks TextExpander! You’ve helped me to spend more time crafting an effective message and less time typing it. Previous Post What are the best community tools for customer service? Next Post Is real-time customer support commendable or crazy?